The postscript to my recent post about the exhibition on Roman crime at Nijmegen helped me to find the subject of this post. In this postscript I mentioned the decision of the Allard Pierson Museum in Amsterdam not yet to give back the items on view at its Crimea exhibition to the lending museums in Ukraine. This post introduces you to an initiative to save archival collections worldwide threatened either by material deterioration, poltical situations or simply by the ongoing progress of modernization in the country or region where they are located. The British Library has set up the Endangered Archives Project (EAP) on a truly massive scale with the aim of digitizing archival records and manuscripts in a few hundred (!) projects. On September 7, 2014 the completion of several projects was announced at the accompanying Endangered Archives blog. Within two months, between July and September, a million images has been added to the online results of EAP, enough reason for me to look a bit more closely to this audacious project and its composing elements. On my blog the British Library received a few years ago criticism for its policies concerning the digitization of British newspapers. Last year I expressed some disappointment at the low number of digitized legal manuscripts at the British Library, but this time the library shows itself as a most generous cultural institution. The EAP portal is accessible in English, French, German, Spanish, Russian and Arabic. The EAP spans the world in a awe-inspiring way. Among the most interesting aspects is for example the fact that researchers and institutions themselves can apply for grants, often starting with a pilot project. The BL provides a framework to support projects. There is no grand scheme of the British Library dictating the goals and direction of general progress. Typically, EAP does not focus on national archives unless they are in dire need of support, and such projects will not cover all materials under the aegis of EAP. Items documenting the pre-industrial history of a country are the first to come under consideration for new projects. The grants support university projects as well as independent scholars. Of course EAP has contacts with the International Council on Archives and UNESCO’s Memory of the World program. The EAP has created five regions for the projects supported by the EAP: Africa, the Americas, Asia, Europe and Oceania. Let’s start with a look at the overviews of each region to spot projects which touch directly upon law, government and administrations. In the second part of this post other projects with law, the judiciary or other aspects of legal matters constitute a major aspect. In the overview for Africa you can find for example EAP 607, a project for the preservation of Native Administration records between 1791 and 1964 held at the National Archives of Malawi. The Matsieng Royal Archives in Lesotho were the subject of EAP 279, where a wide variety of documents and records has been digitized. Colonial history looms large in a number of African projects, for instance in EAP 474, a pilot project for the preservation of pre-colonial and colonial document at Cape Coast, Ghana. In EAP 443 nineteenth-century documents for the Sierra Leone Pubic Archives have been digitally preserved, thus saving the history of a British Crown colony and the impact of slavery, to mention just a few aspects. For the Americas, too, one can pint easily to projects aiming at preserving documents and records concerning the history of slavery and colonialism. EAP 184 started to support the preservation of records of the African diaspora in the archives of the Cuban province Matanzas. The material condition of these records decays rapidly. In Peru EAP 234 aimed at saving the colonial documentation within the holdings of the Sociedad de Beneficencia de Lima Metropolitana, with records reaching back to 1562. 100,000 notarial records at Riohacha and the peninsula La Guajira in Colombia documenting an important entrepôt of Caribbean and Central American trade are at the centre of EAP 503. Hurricane Ike in 2004 was only the last threat to archives with govermental records in Grenada which resulted in 132 reordered and digitized volumes (EAP 295). The number of EAP projects in Asia is much larger than for the Americas. I could not help feeling particularly interested in some projects concerning Indonesia because of its link with Dutch history. EAP 229 and EAP 329 are two related projects dealing with endangered manuscripts in the province of Aceh on the island Sumatra. The digitization of nearly 500 manuscripts helps preserving the cultural and intellectual history of this region. The Dutch fierce attacks on Aceh during the nineteenth century were already a threat to this history, as was the devastating tsunami in 2008. A substantial number of the digitized manuscripts in this project contain texts on Islamic law. Legal history is a central element in EAP 314, a project for the digitization of Tamil customary law in Southern India. The documents of village judicial assemblies between 1870 and 1940 are the subject of this project of the Institut Français de Pondichéry. You can follow this project at its own blog Caste, Land and Custom – Tamil Agrarian History (1650-1950), where you can find also an overview of other relevant EAP projects for India. The recent huge increase in digitized materials within EAP is to a large extent due to the 750,000 images of some 3,000 books printed before 1950 in eight public libraries in Eastern India near Calcutta which have been digitized within EAP 341. The number of EAP sponsored projects in India is really large. On my legal history portal Rechtshistorie I had already put a number of links to digital libraries in india, but EAP brings substantial additions to my overview. Although I am woefully aware that I skip here a lot of interesting projects in Asia I would like to mention at least two European projects. EAP 067 is a project to digitize extremely rare materials, mainly from the twentieth century, about the Roma’s in Bulgaria, including not only ethnographic and musical items, but also for example a manuscript of a history of the gypsies. Keeping these materials at all was often dangerous for the Roma during the communist period in Bulgaria. A second project deals with the results of archaeological excavations between 1929 and 1935 in the Kyiv region of Ukraine (EAP 220). For those worrying about the length of this post it might be a relief to read that within EAP there has been only one project from the Oceania region. In EAP 005 the Australian National University created inventories of materials at the Tuvaluan National Archives. This group of islands in the Pacific is in acute danger of being flooded. 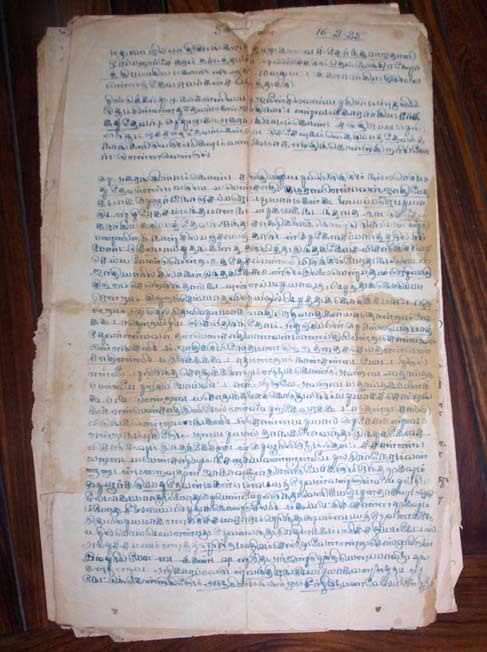 The project concerning the preservation of manuscripts written in the Vietnamese Nôm script between the year 1000 and the twentieth century in EAP 219 is an example of documents threatened by sheer memory loss. The Nôm script went out of use around 1920. For decades teaching this script had been forbidden. The Ecole Française d’Extreme Orient in Hanoi had collected materials before 1954, but no proper inventory had ever been made, and the present storage conditions are poor. The 1,200 surviving manuscripts offer information about laws, courts, imperial decrees and land ownership, Within EAP 272, a project for ephemera and manuscripts in Nepal, a number of manuscripts all dating around 1808 contain legal texts. Drafting a list of EAP collections with materials concerning legislation, jurisprudence, courts and other legal institutions is not an easy thing to do. The EAP website allows simple and advanced searches at item level, but as for now you cannot search for a particular subject or theme at the collection level. This is certainly a blemish, but not an impossible situation. A search for laws shows you only a few projects, but for EAP 144 you get directly a number of digitized manuscript from this project for Minangkabau (Sumatra) manuscripts. Anyway you can retrieve a list of all 240 projects; the short descriptions can be expanded. You can also search for projects using an interactive world map. Browsing the various projects is no punishment, but an object lesson in appreciating the rich varieties of human culture. Projects with legal aspects are no exception. Using the tag Governmental records at the EAP blog helped me in tracing some relevant projects. EAP 688 is a new project for digitizing deed books from the Caribbean island Saint Vincent during the slavery era (1763-1838). EAP 561 aims at creating inventories of and digital versions of records for landownership in imperial Ethiopia. At Accra, Ghana, witchcraft trial records will be digitized (EAP 540). A project to make inventories of court and police records from the period 1820-1960 and digitize some of them has been successfully executed in Gambia (EAP 231). Ecclesiastical records from colonial Brazil are the subject of EAP projects such as EAP 627 leading to the digital archives at Ecclesiastical and Secular Sources for Slave Societies created by the Vanderbilt University. Several projects deal with manuscripts from Mali. Not only in Timbuctu a vast number of manuscripts is still present. Last year the threat of massive destruction of this unique legacy by terrorists became a very real menace; a post on this blog informed you about initiatives for their safeguarding and digitization. Following a pilot project (EAP 269) the projects EAP 488 and EAP 490 focus on manuscripts kept privately by families at Djenné, a treasure trove as important as Timbuctu. Some 4,000 manuscripts are now known against two thousand at the start of these projects. In yet another project at Djenné photographs are being digitized (EAP 449). Often I apologize at the end for the length of my contributions, but this time I am happy to point to the links section of the EAP portal which will bring you to a nice number of projects all over the world for the digital conservation and presentation of rare and endangered manuscripts and records. You might be tempted to say that the efforts of the Endangered Archives Project can deal only with a limited number of projects, but luckily the British Library is not the only cultural institution and research institute to look beyond the borders of a country. Often these institutions have to face the threats of budget cuts, and a political climate in favor of focusing on projects which benefit solely the own nation, or they even have to fall back to provide only fairly basic services. The British Library and all involved in similar projects deserve the gratitude of scholars, of peoples and countries whose cultural heritage is or will be rescued thanks to them. Scholars should be encouraged to look beyond their own culture and national history in order to perceive its peculiarities much sharper and to understand its importance in greater depth. Let’s hope such arguments can convince those responsible for setting cultural agendas and developing research strategies with lasting results. Digitization will be one step in a much longer process, and no doubt digital retrieval and presentation will change its outlook as has been the case already since the earliest uses of computers by historians and lawyers alike. In 2015 Maja Kominko edited a volume of articles commemorating the efforts within the EAP, From Dust to Digital: Ten Years of the Endangered Archives Programme (2015), also available online. The digital version of this book has even embedded audiofiles. This entry was posted in Digital editions, Manuscripts, Peoples and tagged Africa, Archives, Asia, Colonial history, Cultural heritage, Digital libraries, Latin America, Legal history, Middle East, Slavery, Witchcraft on September 19, 2014 by rechtsgeschiedenis.